What Now – Thoughts, ideas, stories, rants, photos and other widly important bits of joy. When my daughter was in elementary school, the PTA purchased a program called Art Vistas that brought classic works of art into the classroom and encouraged kids to explore their creativity. It was tailor made for me! I couldn’t wait to volunteer for it, but for two years someone else beat me to it. I was so disappointed. Sure, there were other things I could do to help out, but I studied art history in college, for heaven’s sake, I wanted that job! My daughter was in third grade when I finally got it. I split the role with another mom and we had a great time. The program they purchased included a lesson in Art History and an Art Project that focused on a specific aspect of design or color theory. There were 2D and 3D projects to make, as well as a variety of mediums to try. Each grade had a different theme with different works showcased so there was never a repeat. 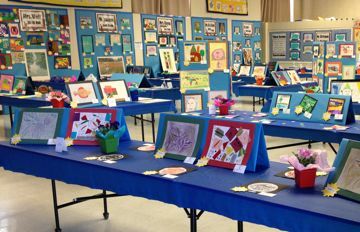 There were 6 lessons per year and at the end we put on a big Art Show so the students could show off their work. It was the best volunteer experience! I would prepare by reading through the history lesson and pulling the works of art to showcase from a giant (organized) pile of them in a supply closet. One lesson included telling the stories of artists behind the old masters to illustrate a lesson in portraiture, followed by having the kids pair up and draw each other. Another lesson highlighted the bold colors and shapes of abstract artists and the kids used oil pastels to create their own. We learned about landscapes, the rule of three, shadow, contrast, pointillism, Georgia O’Keefe, Jackson Pollack and much more. I had the best time working with the kids and seeing them explore their artsy side. One of my proudest volunteer moments came when I asked a class full of 5th graders if they had a favorite artist and almost every single one of them did. It honestly brought tears to my eyes. Art is this secretly amazing, mind-expanding experience. It seems like everyone recognizes this in pre-school, but as kids grow up there’s suddenly no time for it. What’s worse, it becomes something they “can’t” do. “I’m bad at art” is one of those statements that kids (and adults) make that makes absolutely no sense. The term “Art” is so inclusive that everyone can, truly, do wonderful things. Remember this scene from the Princess Diaries? SERIOUSLY – you can create Art. Take the challenge this week — Don’t take yourself too seriously, make a mess, and have a little fun! P.S. If you haven’t seen that movie in a while, you really should watch it again! My earliest memory of volunteer work is helping Grandma Thone pack up food for the man that lived under the tree by the freeway. I was about 5 and I was handing her things to put in a bag. It had been a long day, I don’t know why. I just know she was tired, I remember her breathing hard from the effort and holding tight to the chairs as she moved around the kitchen. She was born missing part of her leg and the limp she had throughout her life was severe. Add in arthritic knees and too many pounds around the waistline and you can imagine that just getting through the day was an enormous physical challenge. 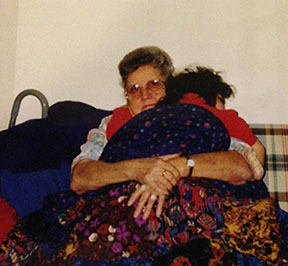 Grandma Thone and Lizzi in February 1998. She had picked up my brother and I from school that day, as she did most days, then drove across town to her house and arrived just after the school bus dropped off three teenage girls in front. Two were sisters and the other had been living there just a few weeks. They were foster children and over the years my grandparents had nearly eighty come through their house. They went school, learned to drive, went to church and celebrated every holiday and birthday with us. As a little kid, I thought of them as cousins. I don’t know if my brother and I had been a handful that day, or if it was the teenagers that tired her out. I just remember that she asked me to help her pack up the food for the man under the tree. I had seen her do it before. She would fill a grocery bag with food and plastic forks. Sometimes she even sent her glass baking dish. A 2L of soda usually went, too, along with a roll of paper towels. Grandpa would drive back to the freeway exit, but he never took us kids with him. He just came back a bit later, sometimes a long time later, and he would tell Grandma that the man said thank you. Grandma didn’t let herself get overwhelmed with the enormity of the homeless problem in our town. She didn’t judge the man by the choices that brought him to living under a tree. She didn’t weigh herself down with the trying to find a solution or helping the thousands of people who needed it. She figured he needed food, so she sent some. She knew she could help this one, those two and maybe one more. She made a difference for them. As a kid, I didn’t know my Grandparents were unique in their capacity for giving, for opening their hearts to serve. It is something I marvel at today. It drives me to give back in any way I can to anyone that needs me. I was so excited to see that the NaBloPoMo theme for September is Service. In an attempt to live up to my grandmother’s legacy, I have always made time for volunteering and find that it is something that feeds my soul in ways I could not have imagined. I have taught art and Sunday School. I have led 4-H projects, served as the Community Club Leader, and on the County Council. I’m currently County Key Leader, All Star Advisor, and Project Leader for 4-H, and I’m on the Board for a new non-profit called the Acrobatic Gymnastics Foundation. I’m often asked how I find time for such endeavors and I simply respond that I don’t do dishes or clean the bathrooms – you’d be amazed how much time it frees up! I love volunteer work and hope that you find inspiration in the stories you read this month. She’s always been the little sister. Not just younger, but really little. Smaller than her friends, delicate features, and just all around fun-sized. Bec (pink shirt) with friends in 2009. Everyone in this photo is the same age. Notice how they are almost a head taller than her. Her petite frame comes in handy for gymnastics, a sport that favors the small. She’s in her third year of competing and we have certainly seen the skills improve, but there is something else… she is so strong! I don’t know if you are familiar with the work out schedule that competitive gymnasts keep. My husband, a former Naval Officer, calls it the SEAL Team work out. Core strength, arm strength, leg power, flexibility … and always with toes pointed, head up and a smile. She loves it. She had a short break over the summer, and couldn’t wait to get back in the gym. She loves her team members, she love competing, she loves the whole package. 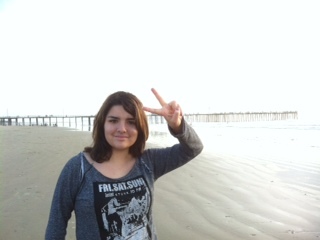 She tried various activities – volleyball, basketball (yes, short as she is, she was awesome on the court! ), and dance. Last year she was a cheerleader in addition to a gymnast. But it is in the gym that she smiles brightest, works hardest and feels strongest. 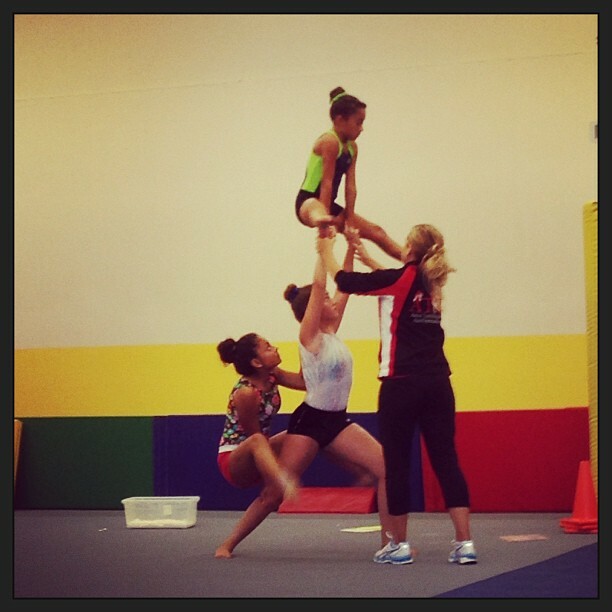 Working on a new skill with her new trio and new coach. That’s my girl in the white leotard and the black shorts. She loves being the base. The steady, strong person that holds other people up. That pretty much describes her personality, too. She’s the go to person for friends, the one who knows the right flavor of ice cream to soothe a broken heart or the goofy face that will bring a smile. She believes in herself enough to cheer on competitors, even when they get the gold. She’s a strong kid. So much stronger than she looks. Imagine that you are afraid of public speaking, I mean really terrified of it. And yet, had a job that required you to address large groups everyday. The people around keep saying that it will get better, that the support is in place, that you will be fine. But you are not. It is just that sinking feeling in your gut day after day day after day. When you have a learning disability, walking into class everyday goes beyond a struggle with the alarm clock. It is day after day of feeling like you are dumb, that you are hopeless. The struggle is constant. We have tried tutoring and any number of therapies, this is not a post about one approach versus another. It is about learning to speak up for yourself. In elementary school, I met with teachers, bought books, and searched for ways to help my daughter. In Junior High the district finally acknowledged that her low Math grades were the result of a disability, not a lack of trying. Once high school started, we had a 504 plan in place to that outlined accommodations for her. For many years, she could not admit just how badly she was struggling. We knew some, of course, it was all over her face. But learning to express the frustration came with maturity. We would have to wait … and teach. As a mom, our natural instinct is to protect our babies. Keep them safe from harm, make their world one that is full or rainbows and happiness. When someone raises a finger against them, we go into full attack mode to defend them. There is nothing wrong with that (well… usually) but, if I am being honest with myself, my job is to teach her the skills she needs to defend herself. She is learning. She proactively approached her Math teacher on the first day of school to explain about her disability. She attempts every problem, but will ask for me to check her work. She takes the news that some of them (or all of them) are wrong with a stiff upper lip and says, “Ok. I will try again.” She has (mostly) gotten past the days when the frustration took agonizing chunks out of her self-esteem. Then today happened. Today she said she almost cried in class. The mama bear in me had been poked! A plan started formulating a in my head, what to say, what meetings to hold, what data I would need to bring… I almost couldn’t hear the rest of the story. It turns out she was exploring her own ideas. She was gauging her feelings, and figuring out what she needed to say to her teacher. She had already weighed the idea of a 1:1 meeting and did not feel it was necessary at this time. She was building her own plan. Our job as parents is to help them grow into strong, independent adults. She is getting there before my eyes. We will ALWAYS be here to support her, it is just a little tough to see that she doesn’t need the mama bear to defend her. I know it will all be ok. She’s totally got this. I have written about my daughter before (and here). This morning I turned on our home computer to listen to music and found her homework on the screen. What I read made me sob with pride. With her permission, I am sharing it here. Our journey was filled with doubt and questions and pain and mistakes and worry. Autism is different in every kid, which means that every family has to find their way through the forest alone. Yes, there are experts and resources available, but what works for one child may not work for another. Your journey is unique. 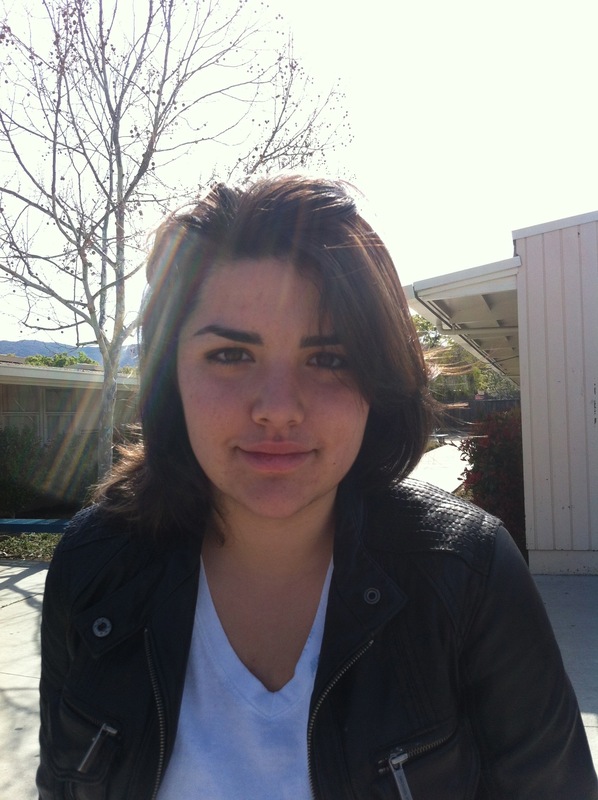 Her high school requires a year long Sophomore Service Learning Project. Through assignments in History and English classes, students study a “world problem” and present their findings at the end of the year. This poem was part of an English assignment. If you know a child with Autism or Asperger’s Syndrome, I hope this brings you some peace. There is hope for a bright future. Monday was World Autism Day and I tweeted some thoughts about our journey. Our story is different than the typical Autism story – for one, it’s my daughter that was diagnosed. That makes her a minority in the Autism world where boys are diagnosed about five times more often than girls. Last week, you may have seen the reports that Autism diagnoses are up to 1 in 88 kids – nearly twice as common as previously believed. The evidence points to better diagnostic practices and I, for one, could not be happier about it. Early interventions make a world of difference in Autism therapies, so if we can get every kid on the spectrum the support that they need – then there is hope for a brighter future. Every kid with Autism has their own story, their own way of expressing the diagnosis. I have read everything I could lay my hands on, but found that the best resources for us when written about girls on the spectrum. Girls are different than boys and I think that once these differences are better understood we will see the incidence rate rise even more. And that will mean that more kids will get the help and support they need. Some resources I found helpful are listed below. Both are written with the older Aspie in mind, and Aspergirls in particular had great chapters on being happy, as well as a chart showing the differences between boys and girls with Asperger’s. Ok – just read this post by Peggy Orenstein. It’s not new, it was originally published in November.http://peggyorenstein.com/blog/why-princesses-wont-be-presidentsThis “princess” connection is fascinating to me. One of my daughters was very into princesses, etc. so to me its not the “evil” empire that some people feel that it is. But then when my daughter was invited to a princess party with other 6 year olds, she went as a pirate. Not a pirate princess, a pirate. I guess I just had a different princess-parenting experience.I see the do-it-all-perfectly-and-effortlessly thing differently, I suppose. I don’t associate that with princesses at all. I associate it with the way women talk and the way they judge each other. I think the limiting factor here is the very real possibility that you will be publicly shamed for leaving your house without perfect make-up, making the slightest mistake or showing any effort whatsoever. The message is clear – do well, girls, and there is an army waiting to tear you down. This is what we have to fight, people. Peggy Orenstein is an award-winning writer, editor and speaker about issues affecting girls and women. ** Please note – NEITHER form of bullying is ok. I bring it up because the contrast was interesting to me.